Despite booming two-way trade, strategic discord and rivalry between China and India is sharpening. At the core of their divide is Tibet, an issue that fuels territorial disputes, border tensions and water feuds. Beijing says Tibet is a core issue for China. In truth, Tibet is the core issue in Beijing’s relations with countries like India, Nepal and Bhutan that traditionally did not have a common border with China. These countries became China’s neighbors after it annexed Tibet, which, after waves of genocide since the 1950s, now faces ecocide. China itself highlights Tibet as the core issue with India by laying claim to Indian territories on the basis of purported Tibetan ecclesial or tutelary links, rather than any professed Han Chinese connection. Indeed, ever since China gobbled up the historical buffer with India, Tibet has remained the core issue. The latest reminder of this reality came when President Xi Jinping brought Chinese military incursions across the Indo-Tibetan border on his India visit in September. 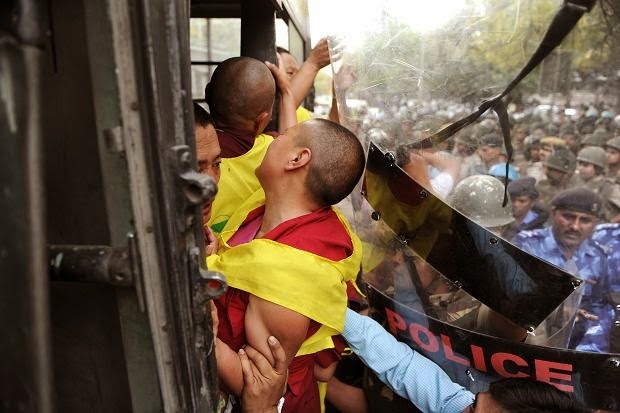 Put off by the intrusions, Indian Prime Minister Narendra Modi’s government permitted Tibetan exiles to stage protests during Xi’s New Delhi stay, reversing a pattern since the early 1990s of such protests being foiled by police during the visit of any Chinese leader. However, during Xi’s visit, India bungled on the Tibet question and another issue relating to the small Indian Himalayan state of Sikkim. The diplomatic goof-ups escaped media attention. Yet the Modi-Xi joint statement brought in Tibet via the backdoor, with India appreciating the help extended by the “local government of Tibet Autonomous Region of the People’s Republic of China” to Indian pilgrims visiting Tibet’s Kailash-Mansarover, a mountain-and-lake duo sacred to four faiths: Hinduism, Buddhism, Jainism and Tibet’s indigenous religion, Bon. Several major rivers, including the Indus, the Brahmaputra, the Sutlej and the Karnali, originate around this holy duo. This new formulation ran counter to India’s position since 2010 — a stance that came with the promise of repairing the damage from India’s past blunders over Tibet, including by prime ministers Jawaharlal Nehru and Rajiv Gandhi. Nehru in 1954ceded India’s British-inherited extraterritorial rights in Tibet and accepted the sprawling region’s annexation without any quid pro quo. Under the terms of this accord, India withdrew its “military escorts” from Tibet, and handed over to China the postal, telegraph and telephone services it operated there. Vajpayee’s blunder opened the way for China to claim Arunachal Pradesh as “South Tibet,” a term it coined in 2006 to legitimize its attempt at rolling annexation. Had Vajpayee not caved in, China would not been emboldened to ingeniously invent the term “South Tibet” for Arunachal Pradesh, which is three times the size of Taiwan and twice as large as Switzerland. And since 2010, Beijing has also questioned India’s sovereignty over the state of Jammu and Kashmir, one-fifth of which is under Chinese occupation. In this light, the reference to China’s Tibet region in the Modi-Xi joint statement granted Beijing via the backdoor what India has refused to grant upfront since 2010. This sleight of hand implicitly endorsed Tibet as being part of China without Xi committing to a “one India” policy. Now consider India’s second mistake — falling for China’s proposal for establishing an alternative route for Indian pilgrims via Sikkim, a state that strategically faces India’s highly vulnerable “chicken’s neck” and where Beijing is working to insidiously build influence. Ironically, it is by agreeing to open a circuitous alternative route for pilgrims via Sikkim’s Nathula crossing that Beijing extracted the appreciation from India to China’s Tibet government. Given that Kailash-Mansarovar is located toward the western side of the Tibet-India border, the new route entails a long, arduous detour — pilgrims must first cross eastern Himalayas and then head toward western Himalayas through a frigid, high-altitude terrain. China currently permits entry of a very small number of Indian pilgrims through just one point — India’s Lipulekh Pass, to the west of Nepal. This year, for example, China will allow a maximum of 1,080 pilgrims to visit in small batches. One obvious reason China chose the roundabout route via Sikkim is that the only section of the Indo-Tibetan border it does not dispute is the Sikkim-Tibet frontier, except for the tiny Finger Area there. Beijing recognizes the 1890 Anglo-Sikkim Convention, which demarcated the 206-kilometer Sikkim-Tibet frontier, yet paradoxically rejects as a colonial relic Tibet’s 1914 McMahon Line with India, though not with Myanmar. The more important reason is that China is seeking to advance its strategic interests in the Sikkim-Bhutan-Tibet tri-junction, which overlooks the narrow neck of land that connects India’s northeast with the rest of the country. Should the chicken’s neck ever be blocked, the northeast would be cut off from the Indian mainland. In the event of a war, China could seek to do just that. Two developments underscore its strategic designs. China is offering Bhutan a territorial settlement in which it would cede most of its other claims in return for being given the strategic area that directly overlooks India’s chokepoint. At the same time, Beijing is working systematically to shape a Sino-friendly Kagyu sect of Tibetan Buddhism. This sect controls important Indian monasteries along the Tibetan border and is headed by the China-anointed but now India-based Karmapa, Ogyen Trinley. The Indian government has barred Ogyen Trinley — who raised suspicion in 1999 by escaping from Tibet with astonishing ease — from visiting the sect’s headquarters at Rumtek, Sikkim. Yet — redounding poorly on Indian intelligence — the Mandarin-speaking Ogyen Trinley has been regularly receiving envoys sent by Beijing. In recent years, he has met Han Buddhist figures as well as Xiao Wunan, the effective head of the Asia-Pacific Exchange and Cooperation Foundation. This dubious foundation, created to project China’s “soft power,” has unveiled plans with questionable motives to invest $3 billion at Lord Buddha’s birthplace in Nepal — Lumbini, located virtually on the open border with India. Ogyen Trinley — the first Tibetan lama living in exile to include Han Buddhist rituals in traditional Tibetan practices — was recently accused by the head of the Drukpa sect of Tibetan Buddhism of aiding Beijing’s frontier designs by using his money power to take over Drukpa Himalayan monasteries, including in the Kailash-Mansarovar area. Indeed, Indian police in 2011 seized large sums of Chinese currency from the Karmapa’s office. Since coming up to power in May, Modi has pursued a nimble foreign policy. His government, hopefully, can learn from its dual mistakes. With China now challenging Indian interests even in the Indian Ocean region, it has become imperative for India to find ways to blunt Chinese trans-Himalayan pressures. One key challenge Modi faces is how to build leverage against China, which largely sets the bilateral agenda, yet savors a galloping, $36-plus billion trade surplus with India. Modi’s “Make in India” mission cannot gain traction as long as Chinese dumping of goods undercuts Indian manufacturing. Also, past Indian blunders on Tibet have helped narrow the focus of Himalayan disputes to what China claims. The spotlight now is on China’s Tibet-linked claim to Arunachal, rather than on Tibet’s status itself. To correct that, Modi must find ways to add elasticity and nuance to India’s Tibet stance. One way for India to gradually reclaim its leverage over the Tibet issue is to start emphasizing that its acceptance of China’s claim over Tibet hinged on a grant of genuine autonomy to that region. But instead of granting autonomy, China has make Tibet autonomous in name only, bringing the region under its tight political control and unleashing increasing repression. India must not shy away from urging China to begin a process of reconciliation and healing in Tibet in its own interest and in the interest of stable Sino-Indian relations. China’s hydro-engineering projects are another reminder that Tibet is at the heart of the India-China divide and why India must regain leverage over the Tibet issue. That a settlement of the Tibet issue is imperative for regional stability and for improved Sino-Indian relations should become India’s consistent diplomatic refrain. India must also call on Beijing to help build harmonious bilateral relations by renouncing its claims to Indian-administered territories. Through such calls, and by using expressions like the “Indo-Tibetan border” and by identifying the plateau to the north of its Himalayas as Tibet (not China) in its official maps, India can subtly reopen Tibet as an outstanding issue, without having to formally renounce any of its previously stated positions. Tibet ceased to be a political buffer when China occupied it in 1950-51. But Tibet can still turn into a political bridge between China and India. For that to happen, China must start a process of political reconciliation in Tibet, repudiate claims to Indian territories on the basis of their alleged Tibetan links, and turn water into a source of cooperation, not conflict. NOTE-- Brahma Chellaney is a geostrategist and the author, most recently, of “Water, Peace, and War” (Rowman & Littlefield).